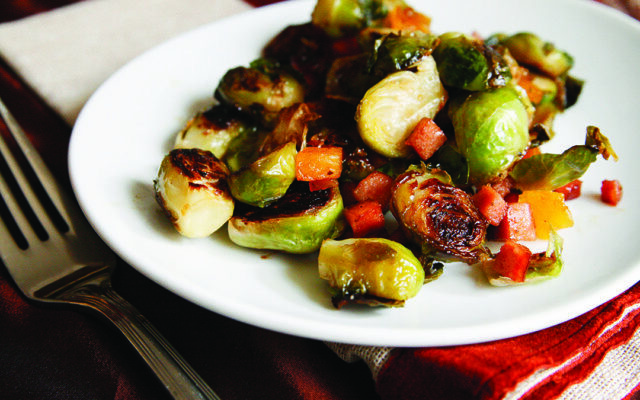 Give Brussels sprouts another chance with this tasty recipe. Overcooked Brussels sprouts are unpleasant and bitter, and are the reason some people cringe at the thought of eating this vegetable. When that’s the only way you’ve had them, you don’t know how good they can be. But well-cooked Brussels sprouts are a delight worthy of cravings and enjoyment. I urge you: give them another chance. This cruciferous vegetable, which grows on thick stalks throughout summer before being ready for harvest in the fall, can be steamed or boiled, but if you want to enhance the flavor then sauteing or roasting Brussels sprouts is the way to go. Roasting, as English went on to explain, allows Brussels sprouts to caramelize and develop a lovely, subtle but clear sweetness. They are also delightful served raw and shredded in salads. High in fiber, the little round balls of leaves are sometimes referred to as mini cabbages by those who aren’t in the know. They aren’t though — in fact, they are more closely related to broccoli. If you’re using ones from a stalk, just twist and pull to separate them from the stalk. Then proceed with the recipe. It’s super easy.